Outdoor and travel accessories company distributes newest portable utensils from humangear. “The reactions from consumers have been great. All GoBites products are highly rated by those who have purchased them,” said Danielle Schroeder, Marketing Coordinator for humangear. LCI Brands™ is excited to announce that it has begun distributing humangear’s® new GoBites™ Uno Mini, Uno 3-Pack, and Uno 50-Piece Bulk Container. When humangear released GoBites in 2014, they had already spent years researching and developing a unique alternative to traditional portable utensils in the marketplace that would be ideal for everyone from outdoor adventurers to office workers. Now, their designs are garnering awards from firms like Red Dot and Fast Company and being featured in publications such as USA Today, Wired, and Backpacker. With multiple options available in the form of the Uno, Duo, and Trio, the new Uno Mini is perfect for kids or for those looking to shave even more ounces off their load. humangear also now offers an Uno 3-Pack as well as an Uno 50-Piece Bulk Container for retailers. Winning the prestigious Red Dot Award, an IDEA Award, and a Spark Design Award, GoBites was also recently a finalist in Fast Company’s Innovation by Design Awards. 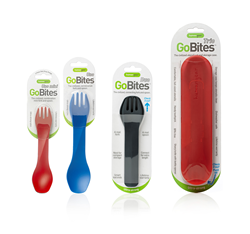 With hundreds or even thousands of entries, GoBites’ innovation allowed it to stand out from the competition. All GoBites products are available through LCI Brands immediately. humangear is a design-focused manufacturer of outdoor, travel and personal care accessories including the award winning GoToob silicone travel bottles, GoTubb hard containers, GoCup collapsible cups, and the capCAP water bottle caps. Find out more at http://www.humangear.com.